Euro-zone’s private sector expansion slowed in December. Will the EURUSD continue declining? After the European Central Bank January 24 decision to leave policy unchanged euro-zone’s economic data have been negative on balance. The economy slowed in the fourth quarter of 2018 compared with the same period a year ago: Q4 GDP increased 1.2% over year after 1.6% growth in Q3. Retail sales growth was slower in December: it rose 0.8% over year after 1.8% increases in November. And private sector expansion slowed in January as evidenced by the Markit Composite PMI. Slowing of expansion in euro-zone economy is bearish for euro. On the 4-hour timeframe EURUSD:H4 is retracing after it hit 4-week high in mid-January. The Donchian channel indicates downtrend: it is narrowing down. The MACD indicator is below the signal line and the gap is widening, which is a bearish signal. 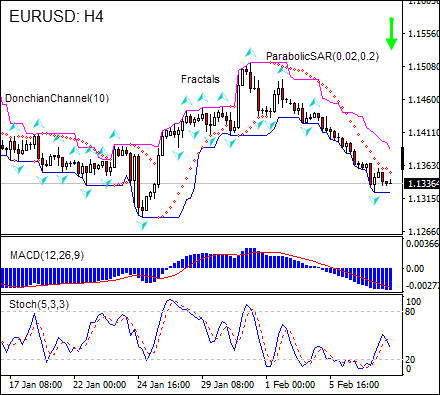 We believe the bearish momentum will continue after the price breaches the below the lower Donchian boundary at 1.1324. A price point below that level can be used as an entry point for a pending order to sell. The stop loss can be placed above the fractal high at 1.1440. After placing the pending order the stop loss is to be moved every day to the next fractal high, following Parabolic signals. Thus, we are changing the expected profit/loss ratio to the breakeven point. If the price meets the stop-loss level (1.1440) without reaching the order we recommend cancelling the order: the market sustains internal changes which were not taken into account.